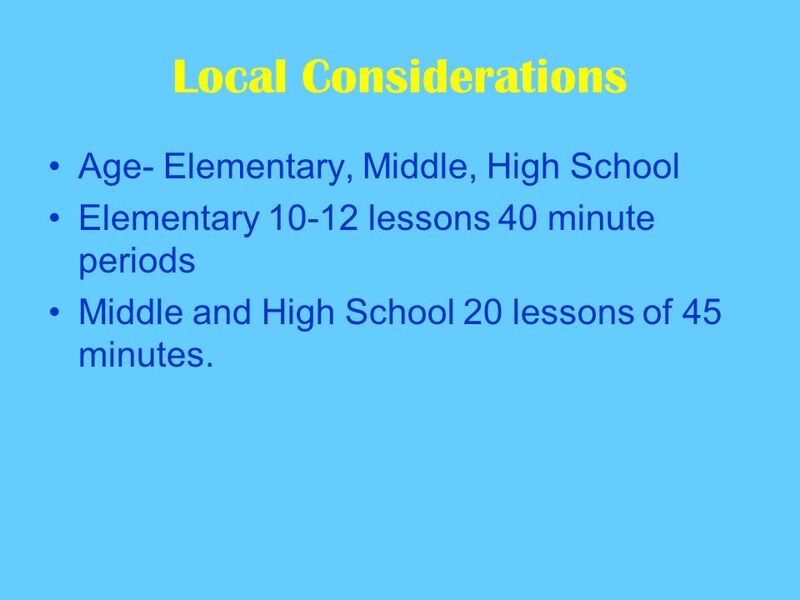 2 Local Considerations Age- Elementary, Middle, High School Elementary 10-12 lessons 40 minute periods Middle and High School 20 lessons of 45 minutes. 6 A frequently asked question : What features of the model are most important and must be adhered to? A frequently asked question : What features of the model are most important and must be adhered to? First answer : Having enough time for a real season. 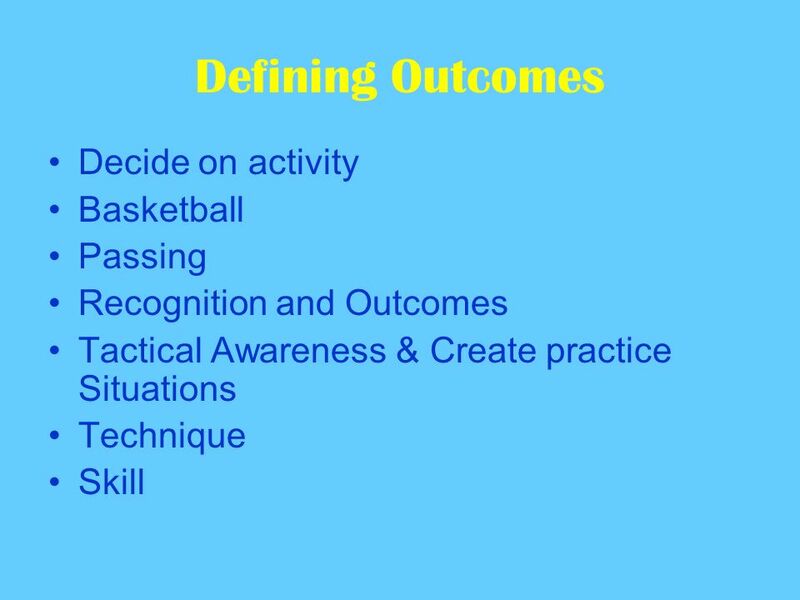 7 Defining outcomes Outcomes describe what a student will know and be able to do as a result of participation during the season... Aim for authentic outcomes: Techniques, tactics and knowledge as demonstrated in context of the game. Aim for authentic outcomes: Techniques, tactics and knowledge as demonstrated in context of the game. 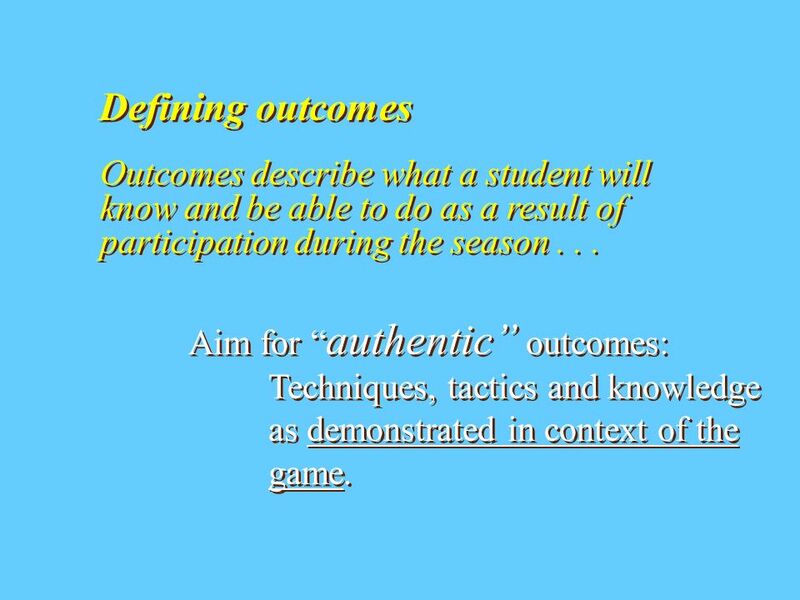 8 Authentic outcomes and Assessment... Assessment has to occur in the context of game-like performance settings. Assessment has to occur in the context of game-like performance settings. Examples of authentic settings for exhibiting performance: Season games Meets Dance performance Championship matches Races. Season games Meets Dance performance Championship matches Races. 10 Preparing for the Season (contd.) Planning TaskDescription Class routines for this season Home field, entry activity Content development Game modifications and sequences, teaching of techniques and tactics, teaching of rules, refereeing, and scorekeeping. Sequence of learning activities. Instructional support Critical elements and common errors of techniques to be taught,. Support for learning tactical concepts. Posters, handouts, etc. Entry activityTechnique, stretching, or fitness focus? Prepare daily technique or fitness posters Culminating eventNature of event. One day or multiple class sessions? Prepare awards. Assessment protocols Decide how performance of roles will be assessed. 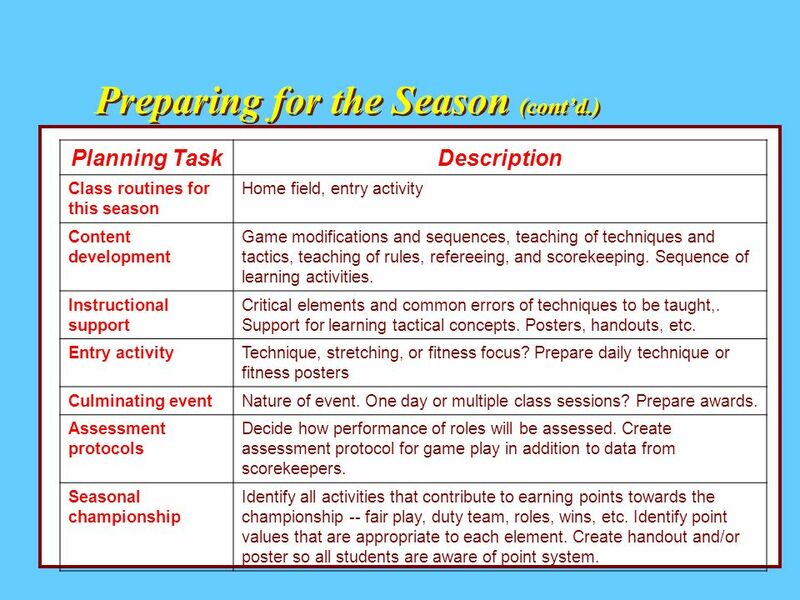 Create assessment protocol for game play in addition to data from scorekeepers. Seasonal championship Identify all activities that contribute to earning points towards the championship -- fair play, duty team, roles, wins, etc. Identify point values that are appropriate to each element. Create handout and/or poster so all students are aware of point system. 11 Preparing for the Season (contd.) 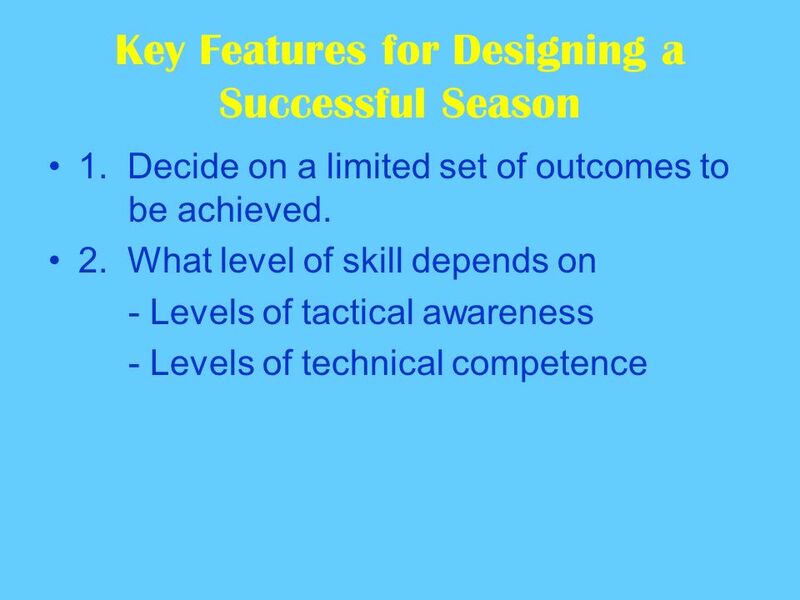 Structure of the season should be known at the outset of the season. 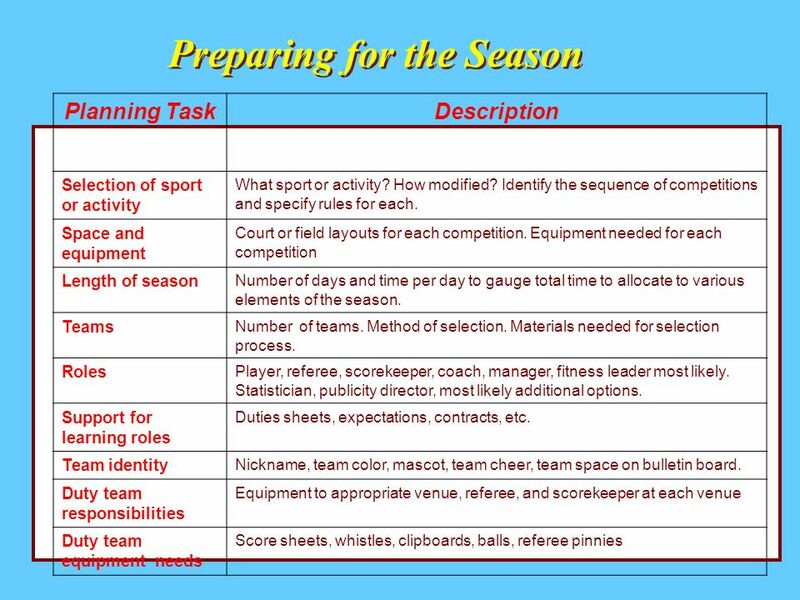 Requires planning and preparation prior to the start of the season. 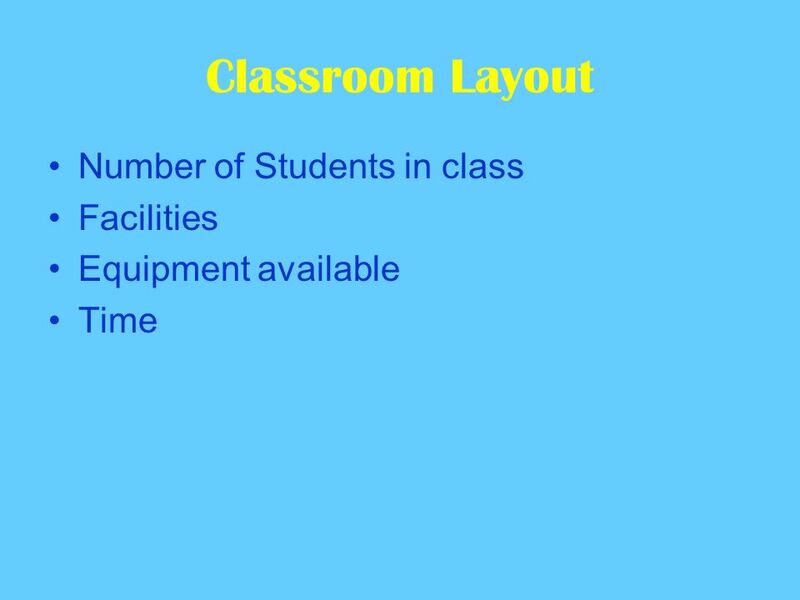 It offers students a clear roadmap & what roles and contributions are expected. 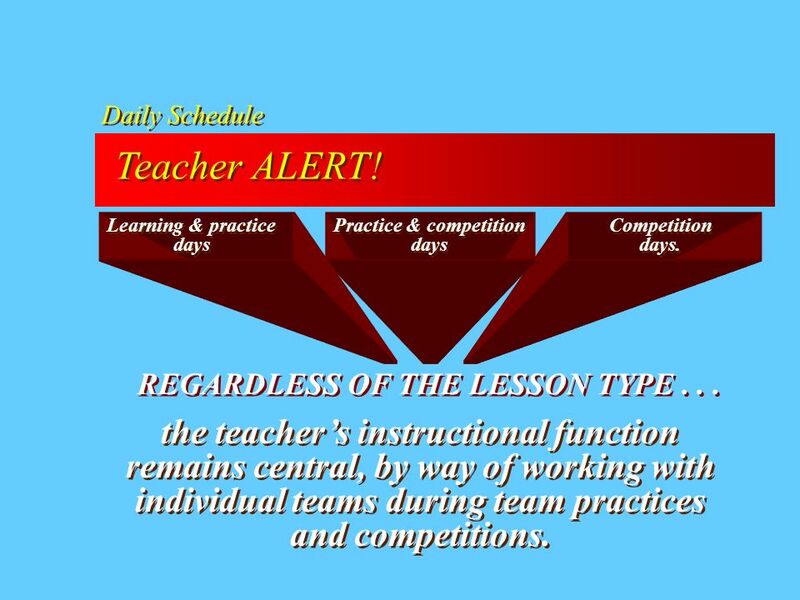 12 Daily Schedule Generally, three categories: Learning and practice days. Practice & competition days. Competition days. 13 Daily Schedule Learning and practice days. Generally, includes both guided and independent practice. 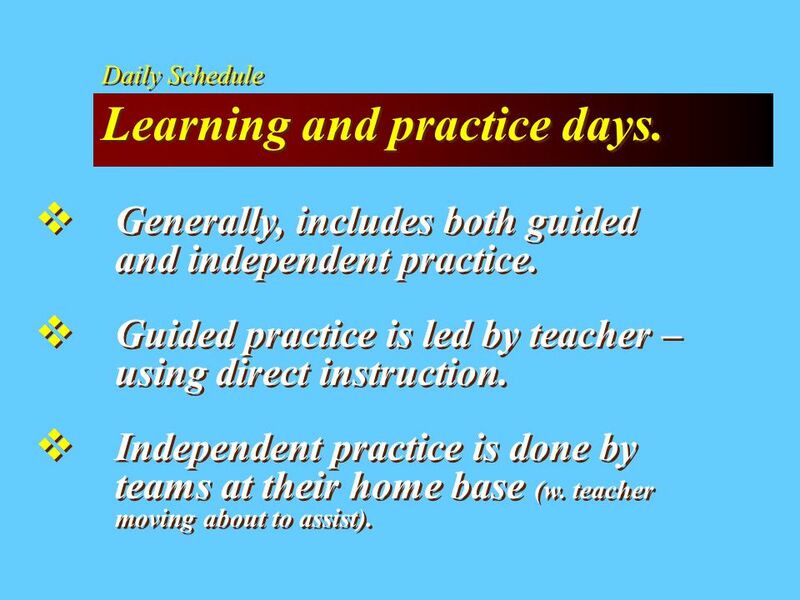 Guided practice is led by teacher – using direct instruction. Independent practice is done by teams at their home base (w. teacher moving about to assist). 14 Daily Schedule Practice and competition days. Includes time for team practices. 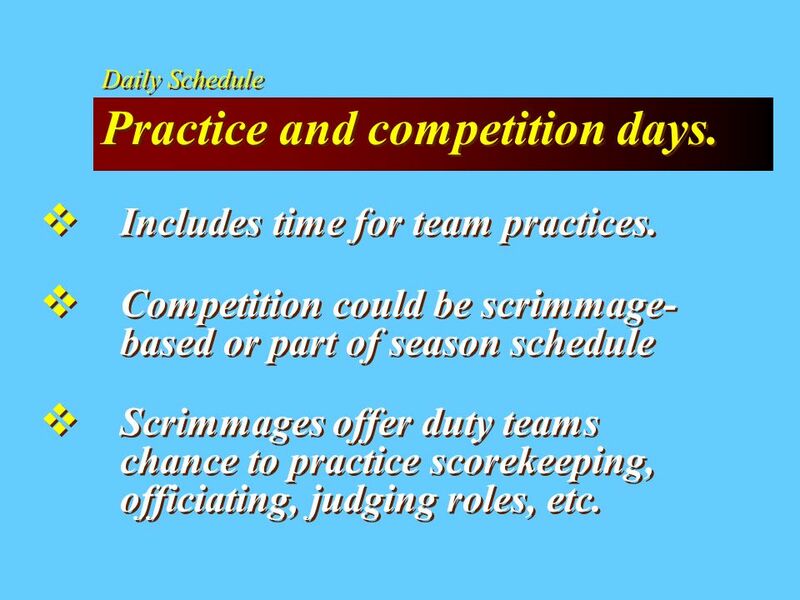 Competition could be scrimmage- based or part of season schedule Scrimmages offer duty teams chance to practice scorekeeping, officiating, judging roles, etc. 15 Daily Schedule Competition days. 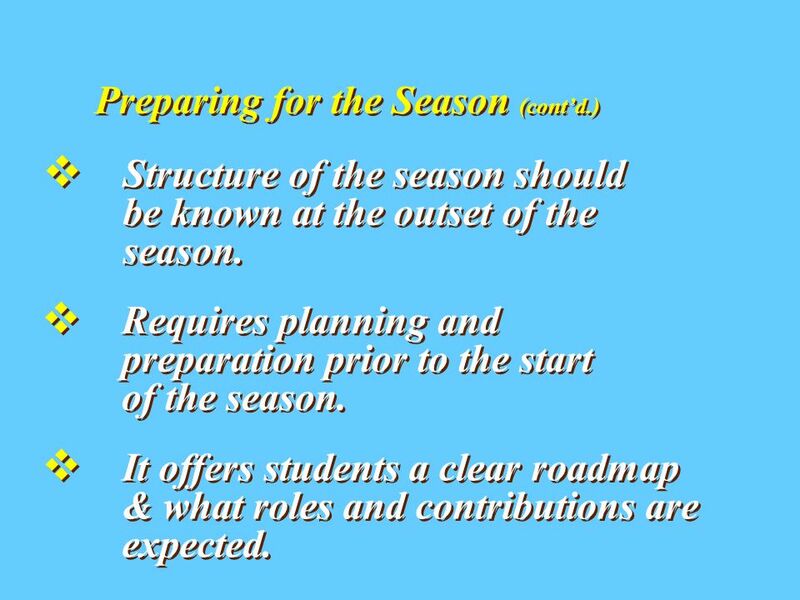 Occur throughout the season, not just at the end. 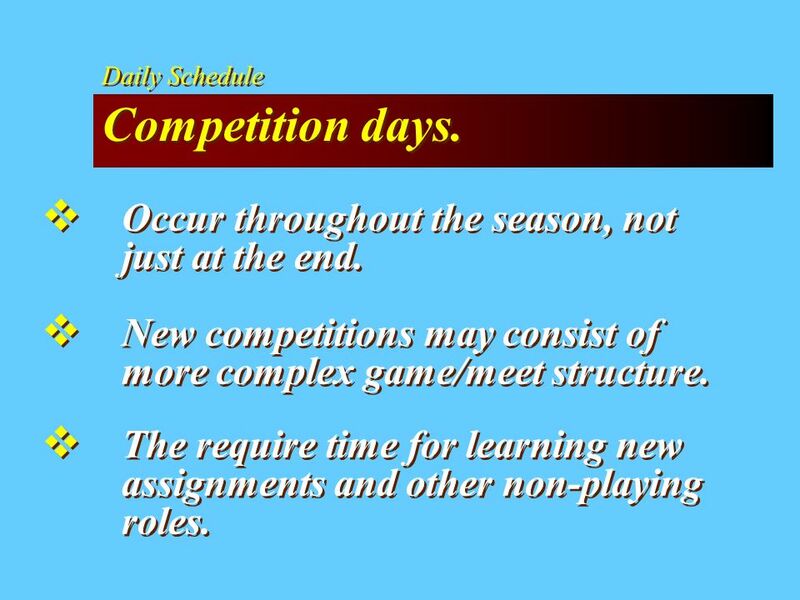 New competitions may consist of more complex game/meet structure. The require time for learning new assignments and other non-playing roles. 16 Daily Schedule Lesson Closure Should be part of each lesson! Highlights excellence in game play and Duty Team performance. 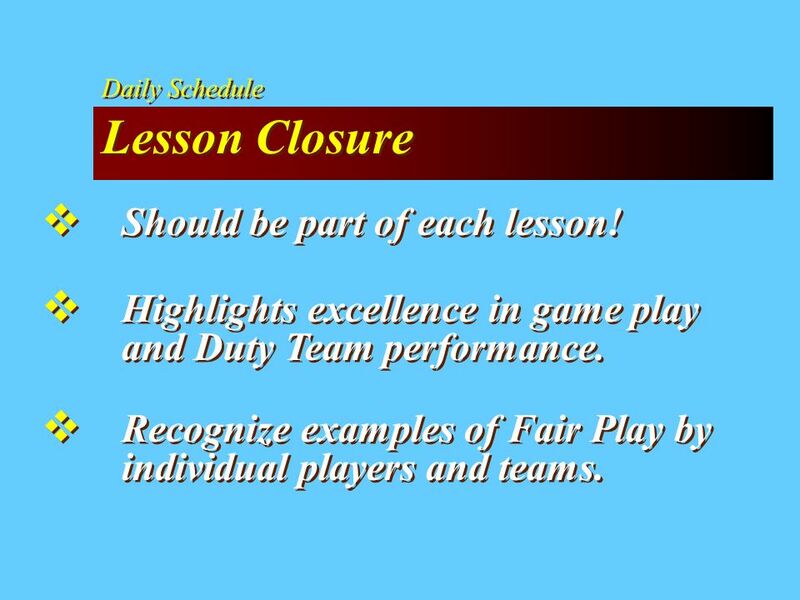 Recognize examples of Fair Play by individual players and teams. 19 First-Time Users (contd.) Start with a bare bones version! Keep Championship points system simple. Award points for the essential aspects of the season: Fair play performance, Competition performance, and Duty Team performance. Award points for the essential aspects of the season: Fair play performance, Competition performance, and Duty Team performance. 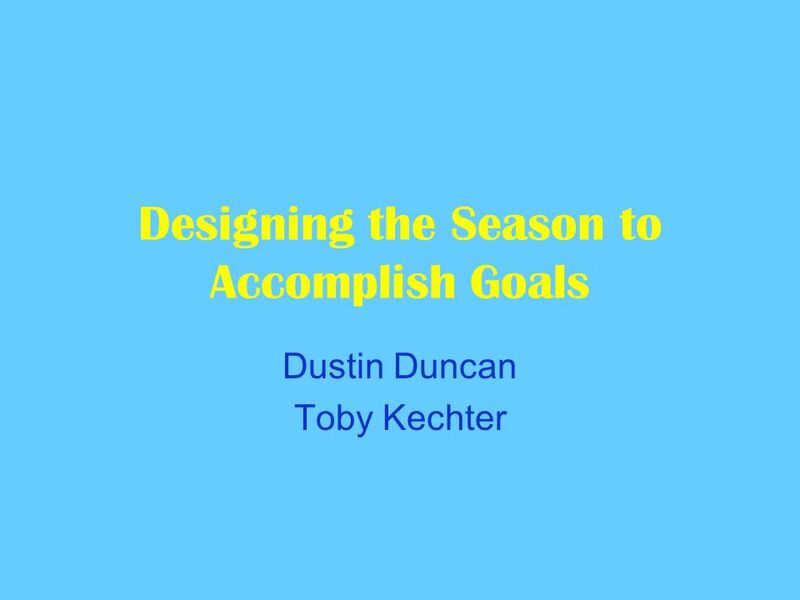 Download ppt "Designing the Season to Accomplish Goals Dustin Duncan Toby Kechter." T HE S PORT E DUCATION M ODEL Created by: Daryl Siedentop. Sport Education - Implementation 1)Initial Planning: 1)Choose a sport you know well 2)Provide students opportunities for involvement 3)Identifying and. Formative Assessments Implemented through the Standard Based Sport Education Model Charla Tedder Parker NASPE National HS TOY 2013 Fuquay-Varina High School. PRACTICAL ACTIVITIES AND ANALYSIS OF PERFORMANCE. PDHPE K-6 Using the syllabus for consistency of moderation © 2006 Curriculum K-12 Directorate, NSW Department of Education and Training. Teaching PE – Other Curricular Models.  Also some older editions available in regular circulation  I have one extra text. Designing Scoring Rubrics. What is a Rubric? Guidelines by which a product is judged Guidelines by which a product is judged Explain the standards for. Sport Education An Overview. Goals of Sport Education A competent sportsperson - sufficient skills and knowledge to participate successfully A literate. Making Sport Education Festive. Festivity in Sport Education Key feature that defines Sport Education. Integral part of sport. Mostly lacking when sport. Chapter 4 4 Organization and Instruction C H A P T E R.